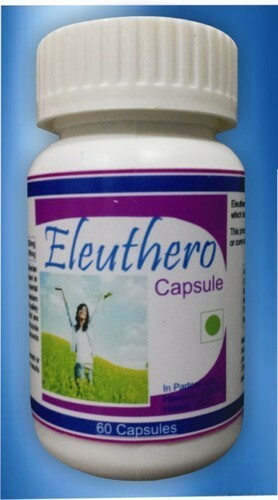 Eleuthero Capsules is an excellent product formulated and designed by Natural care Ltd., an ISO 9001:2008 certified company in partner with Hawaiian Herbals located in Hawaii, USA. This is a HALAL & KOSHER certified product & produced under International GMP regulations. It containsEleuthero sinensis popularly known as Siberian Ginsengis a powerful adaptogenic herb. It has been carrying a plenty of benefits in eastern medicine for thousands of years enjoying a history of both safety and effectiveness. The Eleuthero root used in this product is carefully selected based on high eleutheroside concentration, the plants active therapeutic compounds delivering maximum effectiveness. Natural Care Limited is the leading provider of Unique Natural Healthcare Drops, Exotic Juices, Weight Management Products, 100% Organic Products, Organic Agricultural Products, Unique Wellness Products, 100% Ayurvedic Products, Anti Radiation Range of products, Biomagnetic products, Energy Saving Solution, Health equipments, Home appliances, Oil etc. Natural Care has its own manufacturing facilities in Hawaii for which we are partner with Hawaiian Herbals located in Hawaii, USA which specializes in proprietary pharmaceuticals and active pharmaceutical ingredients. It is one of the largest manufacturers of its kind in the world having own inhouse equipments & R&D facilities. Hawaiian Herbals remains extremely pro-active in regards to growing its business appropriately to fit the current competitive environment, while maintaining a focus on creating value with quality products. Its’ experienced management team is engaged in the growth of our business and is focused on execution. It currently consists of more than 2500 employees & is consistently ranked among fastest growing companies in USA. Hawaiian Herbals is well recognized for its innovation in innovations and R&D utilizing its collective professional experience to kick start its transformation into a major player in the global pharmaceutical industry. It is acclaimed by its customers for its Quality, Performance and Reliability. Natural Care provides private label and custom packaging services with the products that best suits the needs of its customers. Our state-of-the-art processing equipment efficiently re-packages and customized labels produce as per demand. Private labeling and customized packaging allows our customers to market our consistent top quality products with their own label for optimum brand recognition and brand loyalty. Kai Natural Care has the capacity of providing product formulation as per the requirements of customers. We are a recognized brand in providing the most quality world class products in the current scenario based on our marketing excellence. Conformity is met in the quality, efficacy, and purity standards. All the products of Natural Care ltd are 100% natural & these follow international quality control standards. As a world leader, Natural Care ltd integrates latest technologies based on fundamental customer insights and the brand promise of “sense and simplicity”. At Natural Care Ltd., we are driven to ensure that every person and organization we serve received the greatest possible value for their health care investment. We do this by devising the best solutions that help people enjoy optimal health.